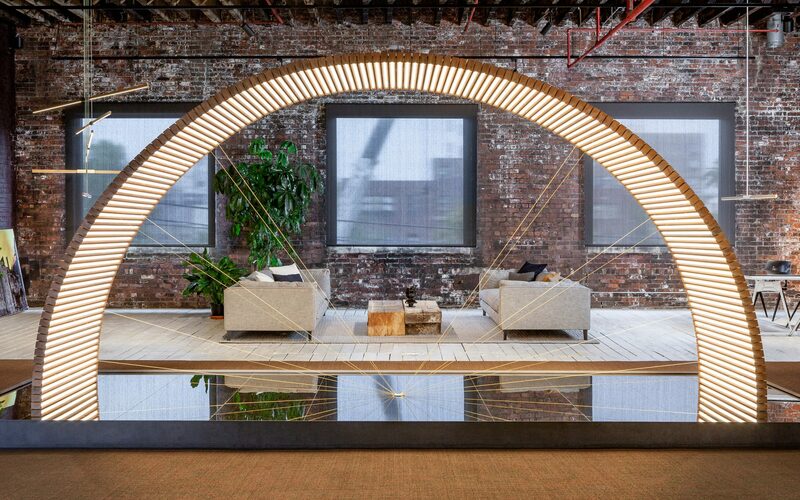 The centerpiece of Stickbulb's new showroom is "Ambassador," a 146-piece custom lighting project that won Best of Show at NYCxDesign 2017. When your goal is to build with light, you need some space to spread out. 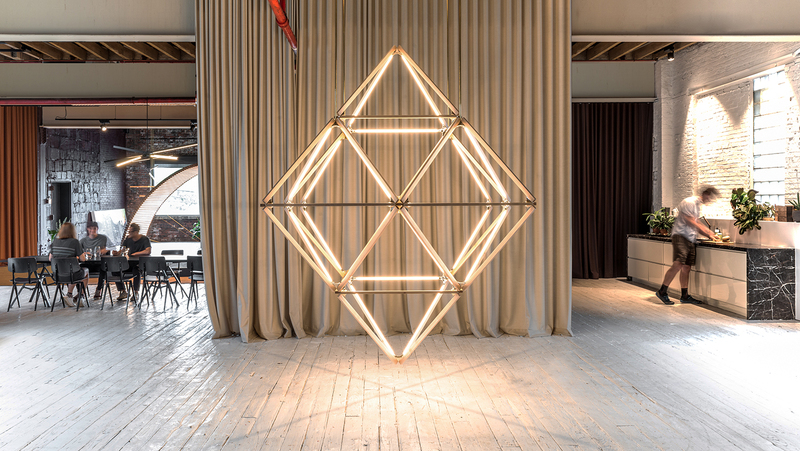 Ten-thousand-square-feet of space, to be exact—at least, that was the case for artisanal lighting brand Stickbulb, which recently relocated to an incredible new showroom and studio in Long Island City. 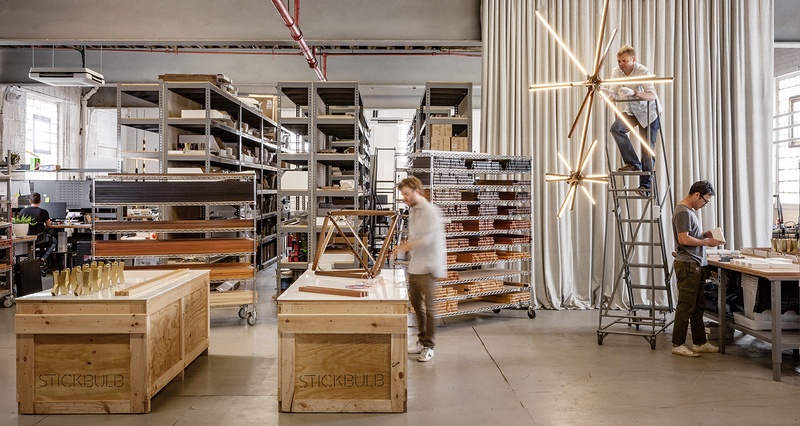 Ensconced in an old factory, the new space perfectly suits Stickbulb, which handcrafts sculptural light fixtures using old wood from demolished buildings, water towers, and trees. The company creates lighting for clients like Google and design firms like Gensler, Piero Lissoni, and Amy Lau. They even created custom chandeliers for Rene Gonzalez’s Plant restaurant in Miami, crafting them in the reddish hue of the Cuban mammee fruit. 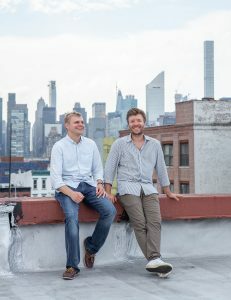 It goes without saying that the company, now in its sixth year, has come a long way from its humble origins in a business incubator space.To learn more, Galerie sat down with co-founders Russell Greenberg and Christopher Beardsley, who started the company together in 2012. Greenberg and Beardsley met at Yale, where they were both majoring in architecture. From there, their paths diverged. 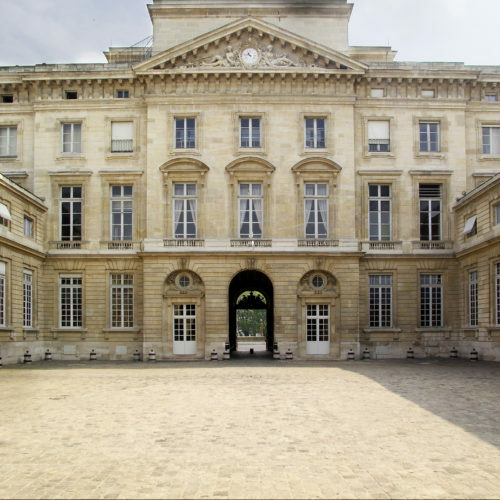 Beardsley worked in real estate development, while Greenberg went on to start RUX Studios in 2008, a company that created widgets and branding assets for clients ranging from burgeoning startups to the tech giant Samsung. The Stickbulb brand spawned naturally from there, and still resides under the RUX umbrella, with Beardsley coming into the picture as a managing partner. 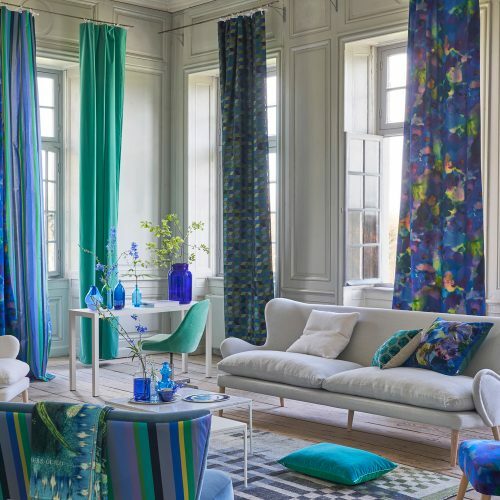 An early indicator of success came at ICFF, the annual luxury furniture fair, in 2012, when the pair exhibited an early prototype and a showroom owner approached them with interest in selling the product. “That was when we decided to go all-in,” Beardsley recounts. From those early days in the RUX office—“we were literally one rack and a desk,” says Beardsley—to now, the road has been one of trial and error. Neither co-founder has any formal training in industrial design; rather, they agree, it’s their shared entrepreneurial spirit that keeps matters of business on track, not to mention a tight team of some 15 employees. Luckily, teamwork is something that the new headquarters, bisected by a theatrical curtain, is more than prepared to accommodate. There’s room for everyone, from designers and fabricators to salespeople and marketing experts. Upon entering, the first sight to greet visitors is a serene showroom. Stickbulb’s signature lighting fixtures twinkle up above and all around, with complementary contemporary furniture throughout the stylish space. Behind the couch, a photograph has been propped against the wall depicting the devastating 2013 Pullman Couch Company factory fire in Chicago. It’s the first frame in a narrative that continues with the coffee table, made of wood that was salvaged from the actual Pullman factory debris. This piece, Greenberg indicated, is in transition. Soon, it, will be taken to the other half of headquarters: a fabrication space, which bustles behind the dividing curtain. There, somebody will break it down with any one of the whirring bandsaws—everything is manufactured on site—and re-wire the finished piece as a light fixture. Call it camouflaged inventory. According to Greenberg, this gradual process, however unusual it may seem, is built into the company’s DNA. “Stickbulb is essentially a modular system that we elevate as a storytelling tool,” Greenberg explained, as if that mission weren’t reflected all around him. 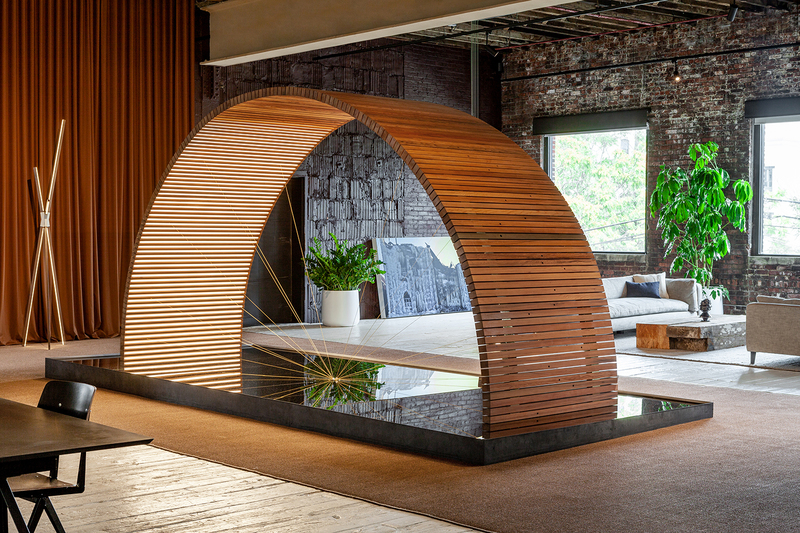 In the center of the showroom is the hearth-like Ambassador, a sculpture of 146 redwood beams that arcs over a mirrored base, forming the illusion of a complete circle. Its diameter is nearly that of the original redwood tree it came from, as well as that of the water tower from which Greenberg eventually salvaged the wood. 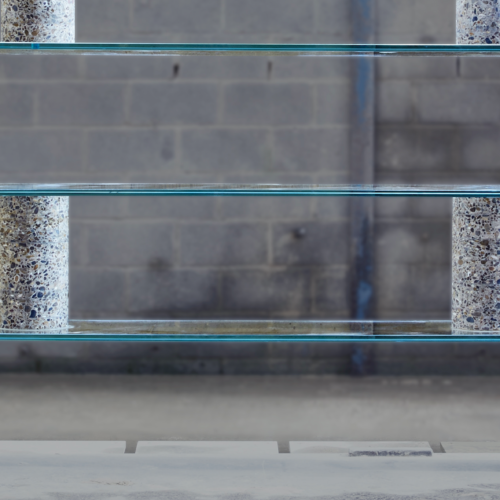 In essence, Ambassador doesn’t just serve the purpose of beauty, although it could — it also honors the unique history of the materials. These days, Greenberg, Beardsley, and the rest of their team never have too much difficulty sourcing wood for their projects. 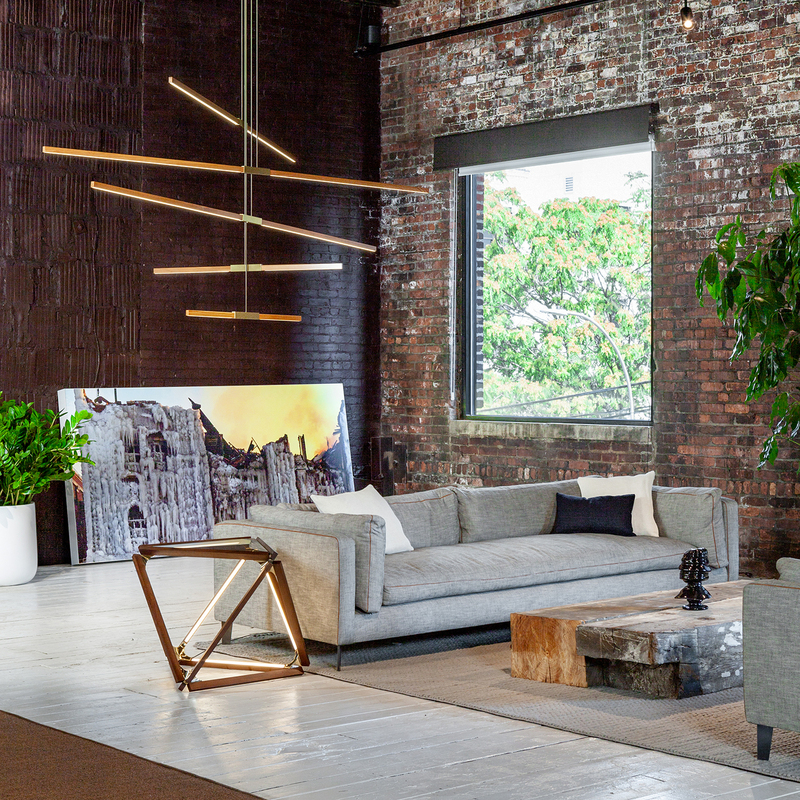 The Stickbulb showroom is located at 10-40 46th Ave in Long Island City, and is open by appointment.